Did the end of Gorbachev’s anti-alcohol campaign cause Russia’s mortality crisis? Russia experienced an extreme spike in death rates in the immediate aftermath of the break-up of the Soviet Union. Jay Bhattacharya, Christina Gathmann and Grant Miller write that while this has typically been explained using political and economic arguments, the real cause of Russia’s mortality crisis may have been the end of Mikhail Gorbachev’s anti-alcohol campaign. What caused this dramatic increase in mortality? Many people attribute the Russian mortality crisis to political and economic turmoil that followed the collapse of the Soviet Union, and to restructuring and reforms during the 1990s. 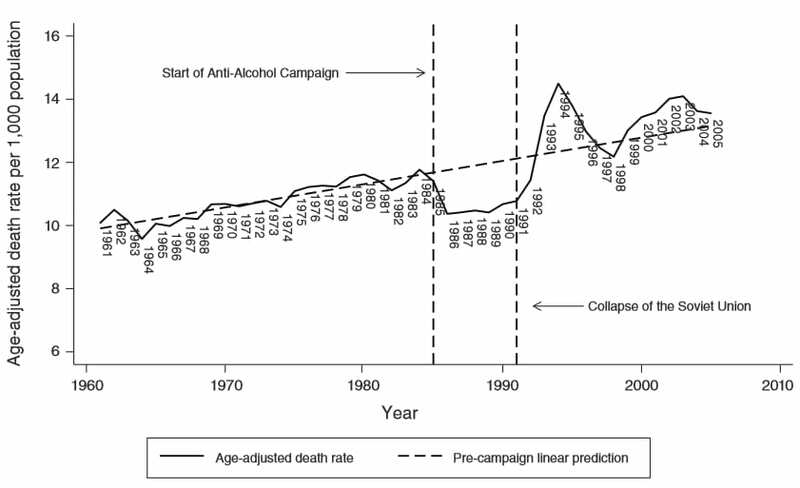 We develop an alternative explanation for the observed pattern: the demise of the reputedly successful 1985-1988 Gorbachev Anti-Alcohol Campaign. The Gorbachev Anti-Alcohol Campaign was unprecedented in scale and scope – and it operated through both supply and demand-side channels, simultaneously raising the effective price of drinking and subsidising substitutes for alcohol consumption. 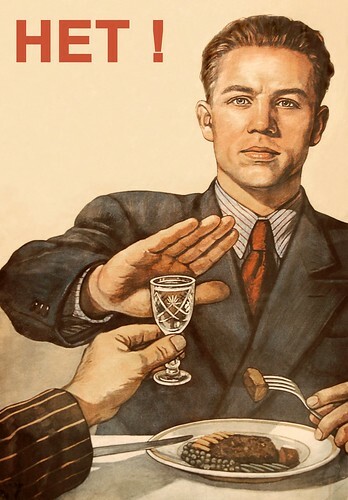 At the height of the campaign, official alcohol sales had fallen by as much as two-thirds (Russians responded by increasing home-production of alcohol called samogon – although our estimates suggest not by nearly enough to offset the reduction in state supply). In practice the campaign lasted beyond its official end – restarting state alcohol production required time, and elevated alcohol prices lingered. Figure 1 illustrates our basic logic. Age-adjusted Russian death rates had been increasing linearly between 1960 and 1984, plummeted abruptly with the start of the campaign in 1985, remained below the campaign trend throughout the latter 1980s, rose again rapidly during the early 1990s to a temporary peak in 1994, and then largely reverted back to Russia’s long-run trend. NoteData available from The Human Mortality Project. Pre-campaign linear trend estimated using ordinary least squares regression of mortality per 1,000 population on pre-campaign year.